This is the main reason why i do NOT recommend VirtualBox. It is an already known error from VirtualBox forum and still no fix for it till i write this blog. 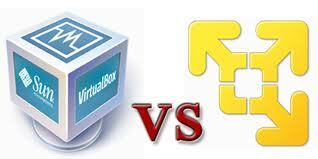 Of course, we could ignore this and indeed VirtualBox will get started after few seconds. However, I never get my RH5.0 Enterprise Linux run – right struck in the hardware init. I am NOT sure if it is related with this error. However, it really makes me think about another virtual machine – as you know, VMware Player. Thanks to VMware Inc., now we could create virtual machines in VMware Player and though it is NOT open srouce, it is FREE – Forget VMware Workstation right now. You get VMware Player for FREE! Now, i installed Solaris 10 b50 on it and it works well without any error. Please kindly note that you may need to download the OS tools to support corresponding OS – Linux, Solaris, FreeBSD, Windows…I would recommed downloading them all before you install any guest OS. Conclusion: It would be nice for VirtualBox running on Solaris. However, this is not the same case on my Windows XP with SP3 – VMware Player wins this round. This entry was posted in OS and tagged VirtualBox, VMware Player. Bookmark the permalink.